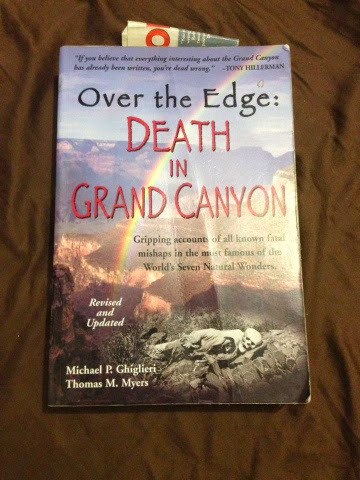 DIRTBAG BOOKCLUB: OVER THE EDGE: DEATH IN THE GRAND CANYON by Mike Ghiglieri & Tom Myers | DBP MAGAZINE ONLINE The World's Best Free Whitewater Publication. Getting ready for your epic mission on the Grand? Or just cooling out after a great season this year…Whether the Wallace was delivered from the river, from the rocks, from a fall or from a thunderbolt, even an airplane, this book has EVERY SINGLE documented death in the Grand Canyon. From the famous to the unexplained, you’ll be along for the ride in this fun read. …struggled violently for several minutes to get out from under the raft. Failing to extricate himself, he continued to lay on his back under the water with his head aimed downstream. At least one of his feet, it still seemed, remained trapped under the overturned raft. …the recirculating “eddy” water at the foot of the falls – again opaque due to recent rains – held Leimkuehler in a Maytag effect, recycling her in a static location, tumbling, tumbling, tumbling under water. George scampered to the base of the falls and scanned for Leimkuehler. Nothing. She shallow-dived in and tried to pull herself along the bottom against the current to reach the recirculating water where Leimkuehler must be. But, perversely it seemed, the creek swept George downstream. George tried again. Again no dice. She looked up at Kim and asked if he had seen Leimkuehler. Kim, in hysterics, sobbed, “No”…. i love this book as much as i love seeing tourists slide out onto an icy ledge of the canyon to get a picture. "Just back up a bit" says the photographer…..